Spain's Lesielle Cosmetics presented its Kickstarter-funded Lesielle Adaptive Skin Care system at the recent Cosmoprof Worldwide Bologna and came away with the event's Best of the Best award. The system offers personalized skin care that evolves with the user's needs and personal preferences. Bases: A catalogue for skin type and hydration (oily, normal, combination, dry and sensitive) and texture (light, nourishing and oil-free). Anti-aging—To repair and correct signs of aging and improve the appearance of skin. Includes retinol (vitamin A), lifting effect, niacinamide (vitamin B3) and peptides. Antioxidant—To protect skin from aging and improve overall appearance. The range consists of vitamin A, coenzyme Q10 and resveratrol. Antioxidant & Tone and Spots—With the active ingredient vitamin C, provides a brightening effect and corrects spots to improve skin’s tone. Protection & Care—Includes aloe vera, hyaluronic acid, anti-pollutants, urea and argan oil, to protect skin from the environment and assist in regeneration. Imperfections—Salicylic acid (BHA) and glycolic acid (AHA) to correct imperfection, blackheads and pores, and to smooth the skin. Redness—Selected for sensitive skin and those with tend to have redness, the active ingredient, bisabolol, provides a calming effect to help skin return to its natural state. 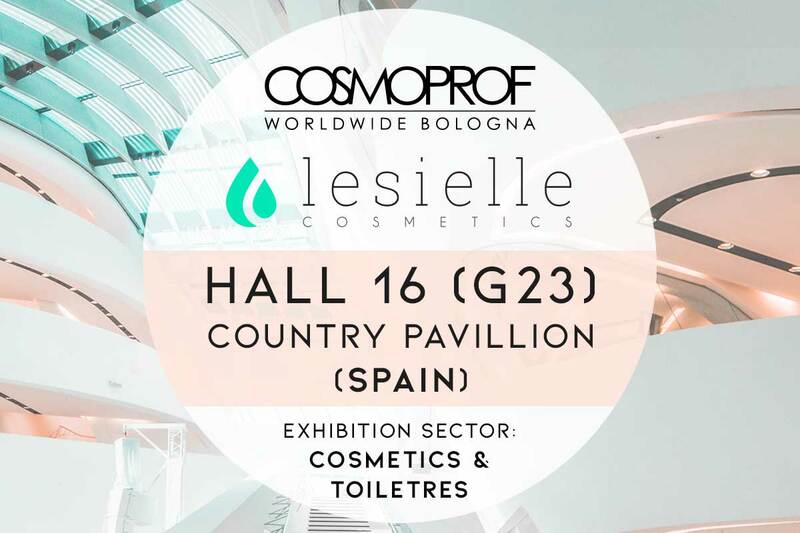 Cosmoprof Worldwide Bologna will be held March 15–19, 2018; Lesielle will be located at stand G23, hall 16.